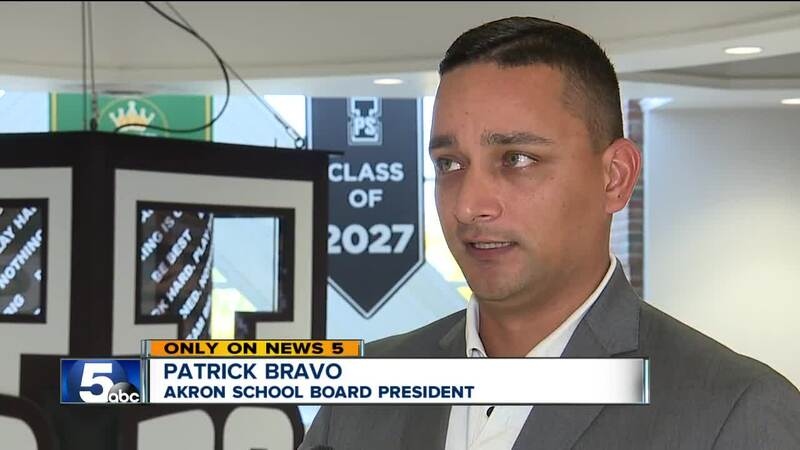 The Akron School Board accepted another sizable donation from the LeBron James Family Foundation for the I Promise School, and in a separate action, moved ahead with a plan to get rid of several old school buildings. The foundation has donated nearly $3 million towards the unique school for at-risk students on West Market Street, including $412,000 to provide further support. "The additional supports that are being provided by the foundation provide for the extended school day, the extended school year, the additional mentoring, coaching, counseling, and family supports that go into the building," said School Board President Patrick Bravo. The I Promise School will eventually house students in first through eighth grades. LeBron James returned to his hometown in July to help open up the school which started with 240 third and fourth graders. "Kids just want to know if we care about them. They have dreams. They have aspirations," James said at the time. Jason Andrew, an Akron barber, has a third grade daughter in the school and has noticed significant progress in her spelling and reading. "She was a shy, young girl. Now she opened up. I can see the difference in her since she started going. She wants to go to school," Andrew said. Bravo estimated the cost for the school will be around $8 million by the time the building is full of students from all of the grade levels. The district will pay for more than 50 percent of the costs, but the board president said the foundation's money makes a huge difference. "They've committed to making additional contributions as necessary." As the new-age school receives more cash, the district is preparing to put 10 decommissioned schools on the auction block. Many of them are only used for storage and haven't had any students for several years. "They are no longer of educational value to us. In fact, if anything, they're a drain on the district's resources. It's time to get rid of them," Bravo said. The buildings are Adult Vocational Services Building, Bettes Elementary School, Erie Island Elementary School, Goodrich Middle School, Goodyear Middle School, Hotchkiss Elementary School, Lawndale Elementary School, Lincoln Elementary School, Rankin Elementary School and Smith Elementary School. Bravo doesn't see a trend of the district cutting back on resources while the I Promise School receives more outside money. "The district isn't scaling back, but we are being very intentional about right-sizing. I mean, our population decreased over the last 15 years by about 30 percent, but our footprint only declined by about nine percent," he said.